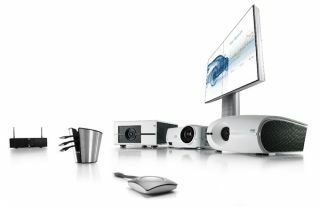 On the heels of Barco’s success with the ClickShare wireless presentation system and the acquisition of projectiondesign, the Belgian display manufacturer has made its first step into the corporate AV market with three new series of projectors. For the initial rollout, the Present, Collaborate, and Impress lines total 10-plus projectors targeting the mid-market—a first for the company, which traditionally focuses on the higher end. They incorporate Barco’s sleek, minimalist, European design aesthetics into equipment geared towards meeting rooms, boardrooms, higher ed classrooms, and auditoriums, among other similar applications. The design premise was to build upon ClickShare’s success to encourage teamwork through intuitive operation. The two models introduced in the Present range come in WXGA resolution with 4,750 ANSI lumens (PFWX-51B) and WUXGA resolution with 4,650 ANSI lumens (PFWI-51B). The single-chip DLP Present projectors ultimately range from 5,000 to 10,000 lumens, the largest family of the three in the corporate AV line. The Collaborate projectors feature a large enough pixel space to enable multiple users to present content on screen simultaneously. The CNWU-61B offers 6,000 lumens brightness and WUXGA resolution; the CRWQ-62B provides 5,500 lumens and a WQXGA resolution. A high-brightness color wheel and all-glass lens ensures sharp images. The Impress line of three-chip DLP projectors feature 8,300 lumens light output and WUXGA resolution, provides the highest quality and brightness of the three corporate AV lines for large screen projections. All three lines are future proof for eventual upgrades and expansion, XGA to WQXGA resolution options, and a simple, one-button remote control and user menu. The Barco corporate AV line also includes the OBLX-55 freestanding video wall display, holding four 55-inch near-seamless LCD panels in a 2x2 landscape setup with 4K. Being freestanding, the display does not require wall support. A 3.1 portrait mode option is available, as well as extension kits to expand the video wall with additional columns. Barco plans to continue adding to the corporate AV line, but will stay out of the portable projection market, noted Neil Wittering, director, sales and marketing, western region.